It all started when I began reminiscing about the TV shows and stars of my youth. Saturday morning cartoons with Gene London, or the wonderfully cheesy Sunday morning classic, Larry Ferrari, at his Hammond organ. 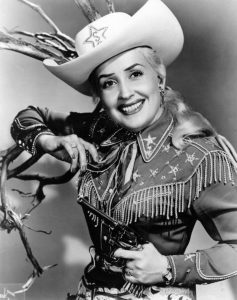 But the shining star of them all was one important cowgirl, Sally Starr, a kids TV cultural icon of the early 1960s. These memories coincided with the start of frequent driving tours of South Jersey and my re-discovery of the rodeo at Cowtown. It was most definitely a Philadelphia area thing, but Sally Starr´s TV show was on Channel 6 at 4pm Monday to Friday. “Sally Starr’s Popeye Theater” provided a full 30 minutes of happy. There were Popeye cartoons and The Three Stooges. She’d wear fringe, shiny silver stars, a cowgirl hat and boots, as well as guns and holsters. She was blonde and beautiful, and her nickname throughout the Delaware Valley was “Our Gal Sal”. Her signature catchphrase was “Love, Luck and Lollipops”. We really don’t have enough of any of those things anymore. When her show was cancelled in 1971 it drew the largest mail protest in the channel’s history. We got to meet Sally Starr in 2005. It was a surprise for my mother’s birthday. Sally Starr had a pizzeria back then. That was before it burned down. We went and sat and talked with her for a while. She was quite old but she arrived dressed in her cowgirl outfit. The first thing she did was invite both me and my sister to sit on her lap. It was a highlight of my life. Sally Starr died at the age of 90 in 2013, but her memory will forever live on. After that encounter with Sally, I really began reconnecting with my inner cowgirl. 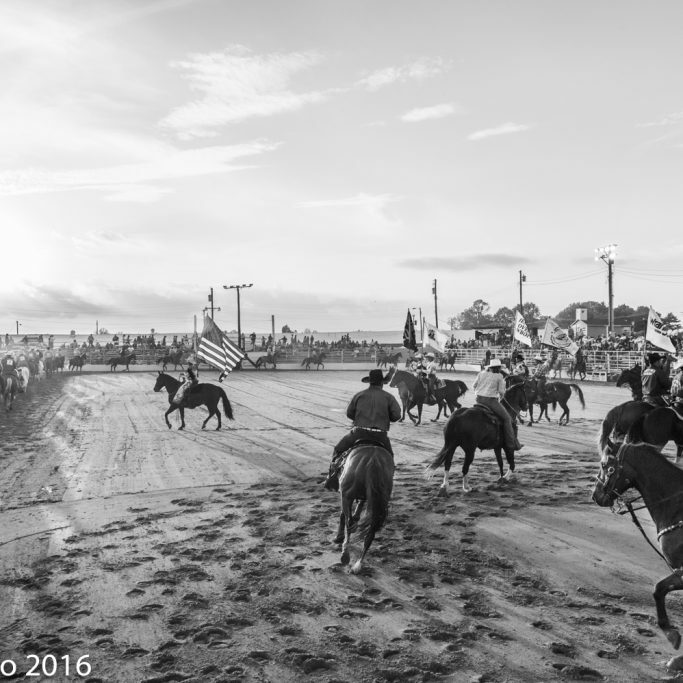 I revisited a place that was stuck deep in my memory: Cowtown Rodeo, in Pilesgrove, NJ. I hadn’t been there since I was very small. Originally established in 1929, the rodeo at Cowtown is the oldest weekly rodeo in the United States, and yes, it’s in New Jersey. Today it is still run by fourth generation family members, Howard Grant Harris and his wife Betsy. Both of them were kind enough to grant me access to the event over a period of many years. I really got started shooting there in 2007. I got to know the riders and the inner workings of the rodeos. It’s very challenging to shoot a rodeo, but I have a few special spots. Most of the pros there use ladders to shoot over the fence. I have had a lot of practice and the pro photographers there are super helpful. On a Saturday night in summer, I’d be climbing on top of the chutes for my shots. I also found a few special places around the rodeo arena, where I more than once came eye to eye with a bull. 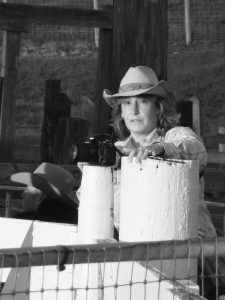 That’s how I became a (wannabe) cowgirl rodeo photographer. 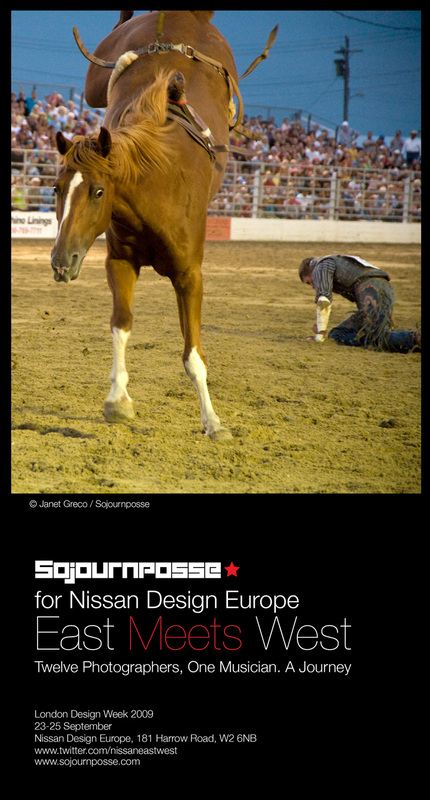 American Rodeo, an exhibition of photographs by Janet Greco, 2007-2011, opens on Sunday, 9th October, at Or Verd Barcelona. 158 Diputació, Barcelona. View the full set here on Saatchi Art where you can also buy the limited edition prints online. The work from this exhibition was also featured in the London Design Festival event, East Meets West, organized by the London digital storytelling collective, Sojournposse. View the film from that event here, and there’s more about my country art collection here.